Key features and capabilities of Google Analytics. 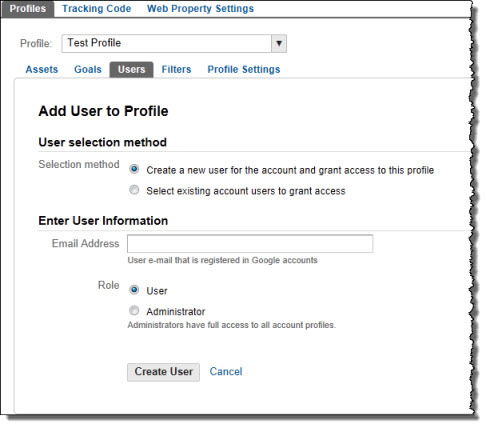 How to set up accounts, web properties, and profiles in Google Analytics. 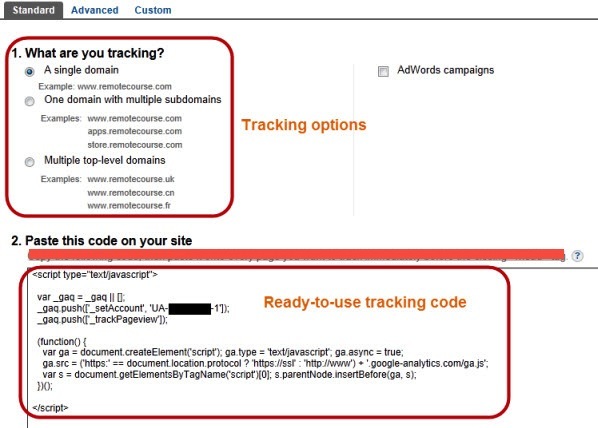 How to activate Google Analytics tracking. Google Analytics is a free web analytics service which provides you with tools for measuring the success of your website or blogs with respect to marketing, content optimization, or e-commerce. Google Analytics originated from a web analytics firm called Urchin which was acquired by Google in late 2005. Google Analytics uses a combination of persistent and temporary cookies for tracking the online behavior of visitors. Google Analytics does not report on personally identifiable information. Google Analytics cookies collect standard Internet log data in anonymous ways and Google does not share this data with any third parties. 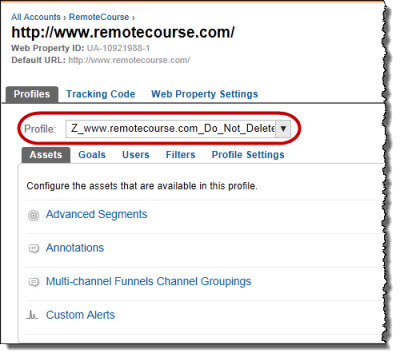 Google Analytics does not track a user across multiple unrelated sites. 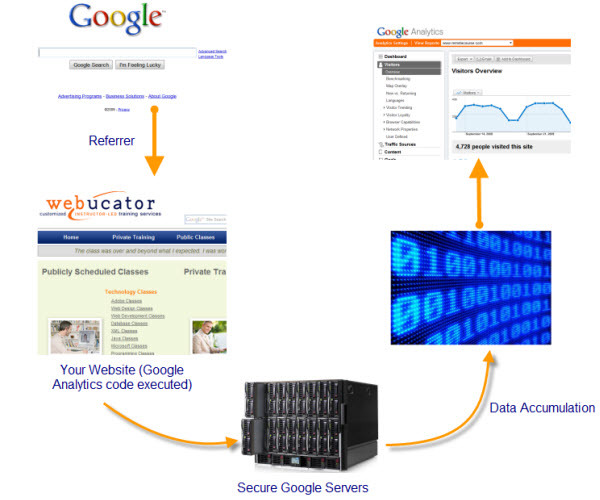 Through the Benchmarking service, you can choose to share your data anonymously with Google. You can opt out of this service. Google offers a browser-based plug-in which allows users to completely opt out of Google Analytics tracking. Google also offers a method called IP Anonymization, syntax: _anonymizeIp(), to scramble the IP information sent to Google. This prevents Google Analytics from reporting geo-location information. For more information on Google Analytics privacy features, please visit: http://seo.blogs.webucator.com/2010/05/26/google-analytics-new-privacy-features/. You can access the Google Analytics home page at the following web address: http://www.google.com/analytics. You will need a Google username in order to use Google Analytics. If you already have a Gmail account, you can use your Gmail username. If you want to create a new Google username for the analytics service, you can do so by clicking the Sign Up Now link shown in the screen shot below. After you log in with your credentials, you will see the Account Home page. This page acts as a home screen from where you can access different set-up options. You can return to the Account Home page at any time by opening the drop-down list above the left pane and clicking the ACCOUNTS LIST button. In this case you will see that there are two accounts listed for this username. We will use these accounts for our course as a test bed. 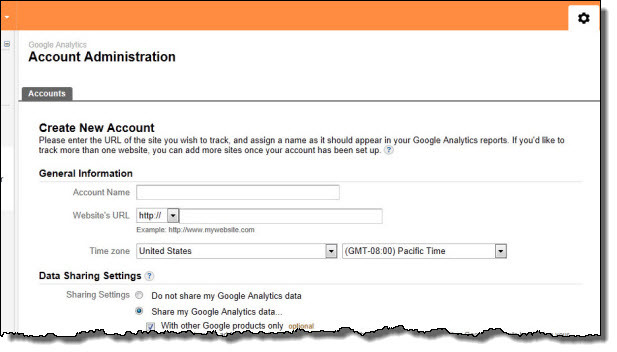 In prior releases of Google Analytics, you could create 25 different accounts under a single Google username. For the current release, the concept of web properties has been introduced, allowing you to manage multiple websites from a single account. From the Account Home page, click the gear icon at the upper right. The Account Administration page opens. Click the + New Account button. The Create New Account form loads. In the General Information section, provide the account name and website URL. Be sure to designate the appropriate country and time zone. Complete the Data Sharing Settings section and read and agree to the terms and conditions in the User Agreement section. After you complete the form, click Create Account at the bottom of the page. In order to effectively track a visitor's behavior, it is recommended that you tag every page on the website with the Google Analytics tracking code. Google recommends that you do not include both the newer and older tracking code snippets together on any given page. Doing so could generate inaccurate data. From the Account Home page, click the gear icon to load the Account Administration page. Click the link for an appropriate account (e.g., Remote Course). 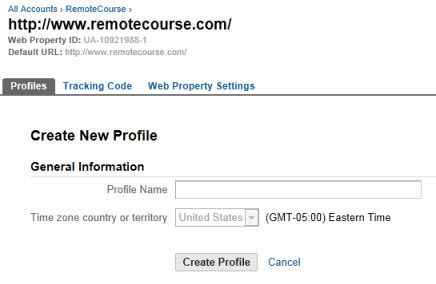 Click the link for the web property within the account (e.g., www.remotecourse.com/). From the Profile drop-down list, select the appropriate profile. Select the Tracking Code tab and scroll down to the set-up instructions. For this class, use the settings shown in the following screen shot. Note: Your tracking code will vary based on which account, web property, and profile you select. Copy the code block above into every webpage you want to track immediately before the closing body tag. Please note: Google recently changed this suggestion and the screenshot above mentions their previous suggestion. It is now recommended to place before closing body tag. Note: You have several configuration options depending on what you want to track and how you want to track it. We will discuss these in brief during our online session. Find at least two of your favorite websites and see if you can determine if they are using Google Analytics. There are two ways to find out which websites are using GATC. Visit any website you like and view the page source to display the code that is running behind the webpage. Using the search functionality, look for urchin.js or ga.js. Most web browsers will show the list of cookies in the Options or Preferences menu. Once you get to this section, look for the particular domain names which you visited and review the cookies which were installed by each of these domains. Websites which are installing Google analytics cookies are using GATC. The Gmail user name which is used for logging into Google Analytics. The entry point into Google Analytics. You can use a single account to manage multiple web properties. A web entity, such as a website, blog, or mobile application, for which you want to gather analytics data. The level in the Google Analytics framework at which reports are accessed. 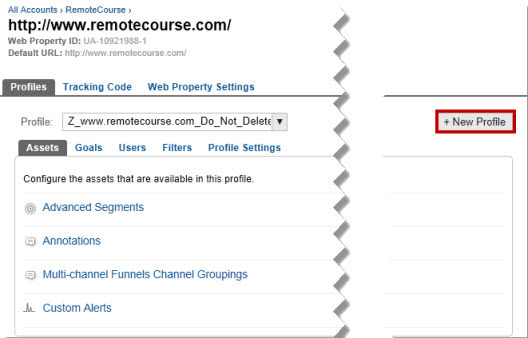 A profile is a customized view of the visitor data for a web property. A single web property can have multiple profiles. Profiles provide flexibility by allowing you to set different rules on the incoming analytics data. 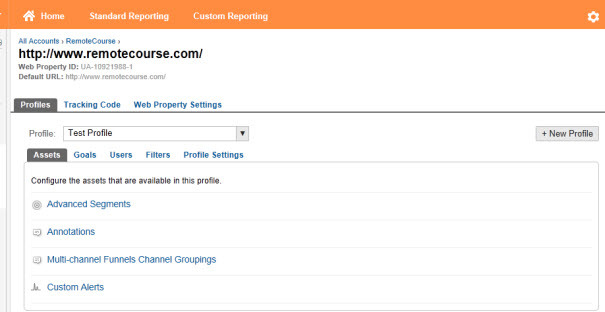 The users added to a profile can view reports based on the data the profile is set up to return. Administrator: An administrator can create profiles, filters, or goals, and can add users. Users: Users have read-only access to reports and can be restricted to viewing only specific profiles. From the Account Home page, click the gear icon. 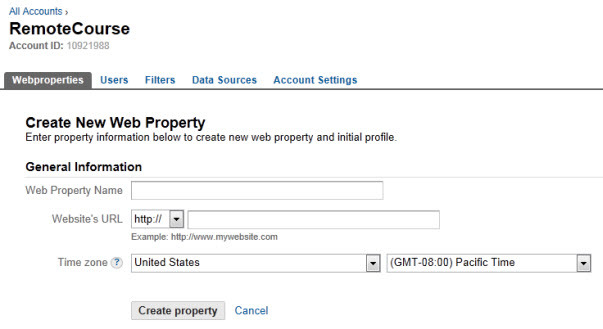 Click the link for the account you want to set up a web property in to load the Webproperties page. Click the + New Web Property button. The Create New Web Property page loads. Provide the property name, URL, country, and time zone, and then click Create property. From the Account Home page, click the gear icon. Click the link for the account, then the link for the web property you want to set up a profile for. The Profiles page loads. Click + New Profile to open the Create New Profile page. Give the profile a name and click Create Profile. The profile is added and the Profiles page loads so you can configure the profile. From the Profiles page, select the Users tab and click + New User. In the Add User to Profile form, select Create a new user for the account and grant access to this profile. Enter the user's email address and indicate whether the user's role is User or Administrator. Click Create User to complete the process. 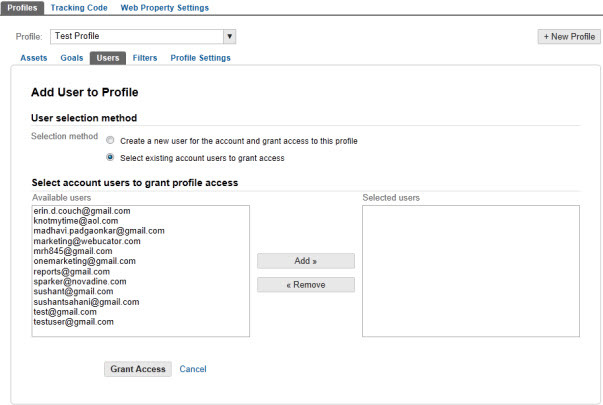 In the Add User to Profile form, select Select existing account users to grant access. Click Grant Access to complete the process. It is recommended that you create separate web properties for tracking separate domain names. For example, please refer to the following schematic where each domain is tracked as a distinct web property. You should create at least one duplicate profile which contains the exact same data as the default profile. Your company has decided to do an online marketing campaign and has hired an external online marketing firm. The new marketing firm has asked for access to your Google Analytics data. You want to provide access to only certain reports within Google Analytics which may be relevant to this marketing firm. Please implement this task in your Google Analytics account. Load the profile to grant access to. Follow the steps illustrated in the section named Granting Access to Users. Use any Gmail username to represent an external marketing firm. Feel free to use . Assign the User role to the user from the external firm. Note: In a real life situation, you would apply filters to this profile such that only those reports useful for marketing initiatives will be available in this profile. You will learn about filters later in the course. ECMAScript and third party cookies. Google Analytics can track all visitors irrespective of their browser settings. All data collected by Google Analytics is completely anonymous. The local computers of the Google Analytics account holder. All data collected by Google Analytics is completely anonymous: A True. 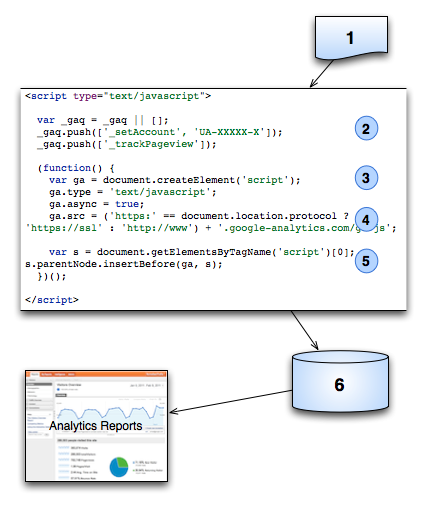 Google Analytics processes and stores web metrics data on: B A remote web server.